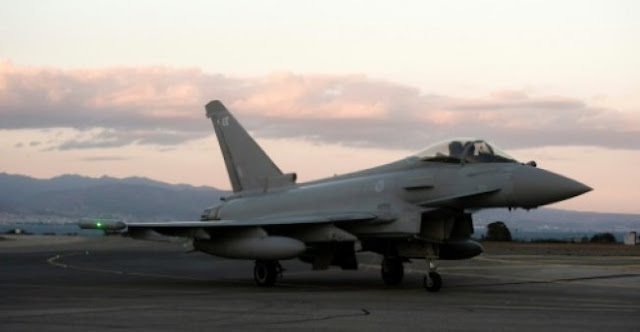 A British Royal Air Force Eurofighter Typhoon fighter jet is seen on the tarmac at the British airbase at Akrotiri in Cyprus on December 3, 2015. DOHA - Qatar on Sunday signed an agreement to buy 24 Typhoon fighter jets from Britain, a second major defence deal signed by Doha during its lengthening diplomatic dispute with its neighbours. "This will be the first major defence contract with Qatar, one of the UK's strategic partners," Fallon said. "This is an important moment in our defence relationship and the basis for even closer defence co-operation between our two countries," he said. The British ambassador to Doha, Ajay Sharma, took to Twitter to announce the deal, which he called a "major step" in defence relations between the countries. There was no immediate comment from Qatar. The agreement to supply the planes brings to a close a lengthy negotiating period. Fallon said a deal was "on the table" back in March 2016. It follows a separate major purchase from Washington. In June this year it was announced that Qatar had agreed to buy F-15 jets from the US in a $12 billion (10 billion euros) deal. And in 2016, Qatar agreed to buy 24 Dassault Rafale fighter jets from France in a deal worth a reported 6.7 billion euros. But the timing of the UK and US deals was particularly crucial for Doha. On June 5 -- ten days before the US contract was announced -- regional kingpin Saudi Arabia, Bahrain, the United Arab Emirates and Egypt cut ties with Qatar, accusing it of backing extremism and fostering ties with their Shiite rival Iran. Qatar denies the charges, claiming the dispute is an attack on its sovereignty. Analysts say the diplomatic crisis shows no sign of ending. The deal also comes as Britain seeks to explore further trade deals outside Europe after voting to leave the European Union. Qatar on Sunday signed an agreement to buy 24 Typhoon fighter jets from Britain, a second major defence deal signed by Doha during its lengthening diplomatic dispute with its neighbours. Qatari defence secretary Khalid bin Mohammed al-Attiyah and his British counterpart Michael Fallon signed a "statement of intent" for the UK to sell the planes, according to statements released by London and on social media.